As one who dabbles in marketing speak (limited quantities left! 24 hours only!) in my other life, I tend to mistrust the labels I see on the boxes and bottles of my products. It continuously astonishes me that beauty companies can make virtually any claim on their products and get little to no consequence for fibbing. So when a product comes along that does what it claims to do, I regard it first with happy disbelief then with unsustainable glee. 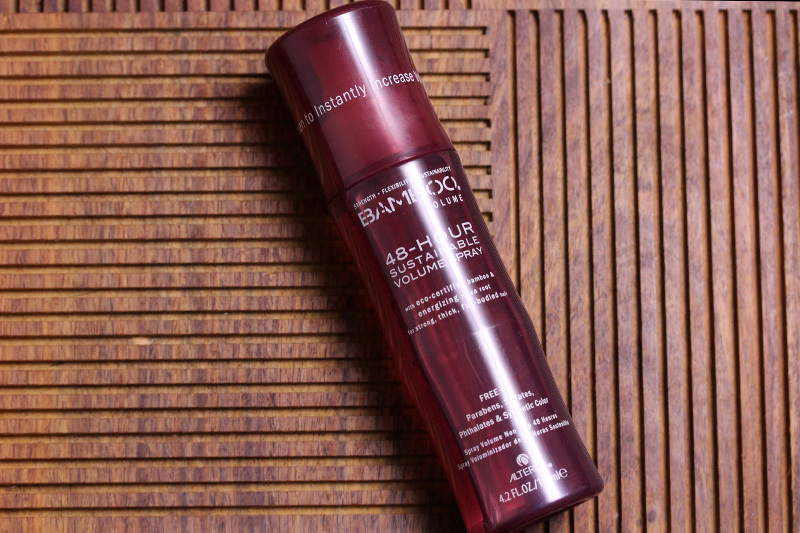 Alterna Bamboo 48-Hour Sustainable Volume Spray has big claims – 2 day plumping to 105% of your original hair volume, "hair is left visibly thickened and noticeably more voluminous with healthy shine" – and you know what, it's true. First, a little about my hair routine. After a lifetime of shampooing+conditioning my hair daily, I've finally managed to cut it down to twice a week (on Wednesdays and Sundays, specifically). The reason I chose to do so was a little bit of buying into the no-poo method and a little bit of making my products last longer. Overall, I can say my hair is now healthier; I can actually go three days before it starts looking like an oily mess (it used to take less than 24 hours). It also takes me three times longer to finish up my hair stuff, which is great on the wallet. I have stick straight fine hair, but lots of it, which weighs it down. I've used volumizing shampoo and conditioner ever since I was allowed to pick my own products, and while I've found a few that works marvelously (Shu Uemura Muroto Volume line, Kiehl's Rice and Wheat line), I have always wanted an extra product for boost. I wanted it to be weightless and most importantly, have no external effect on my hair (like scrunchiness and residue) other than plumping it. The product comes in the form of a hair mist (not a cream! non-aerosol!). Three spritzes all over my head while my hair is still damp, then blow dry with my trusty Sultra dryer. The result is soft hair with incredible volume that lasts through the next day. Alterna Bamboo 48-Hour Sustainable Volume Spray is sold in two sizes, 4.2 oz for $25 and .85 oz for $10 at Sephora.